I am running a PHP site which requires windows authentication on IIS Server. The authentication is fed via Active Directory. For some reason the site is not prompting users to login only on Firefox and only on MacOS and I am getting this page instead of a dialog window prompting to login. And the 401 page is displayed while no credentials were entered before. And still not working after clearing the browser cache and rebooting my Mac. I am not sure if this is a DNS issue, a server related issue, a firewall issue or a browser issue or an operarting system issue. As part of Firefox 30′s release, Mozilla made a change to disable support for NT LAN Manager version 1 (NTLMv1) network authentication. This change affects sites using Microsoft’s SharePoint or IIS services. The Windows version of Firefox 30 should switch to using NTLMv2 authentication automatically, but NTLMv2 is not supported by Firefox on non-Windows platforms. The result for non-Windows platforms is that access may be blocked when Firefox 30 users try to access those kinds of sites. If prompted, click on the I’ll be careful, I promise! button. Once the network.negotiate-auth.allow-insecure-ntlm-v1 setting is located, double-click on the setting. That should change the entry in the Value column from false to true. Once the network.negotiate-auth.allow-insecure-ntlm-v1 setting has been set to true, close the Firefox browser window. Open a new browser window and attempt to access the SharePoint-based or IIS-backed site. You should now be able to log in. Not the answer you're looking for? Browse other questions tagged php macos firefox iis active-directory or ask your own question. 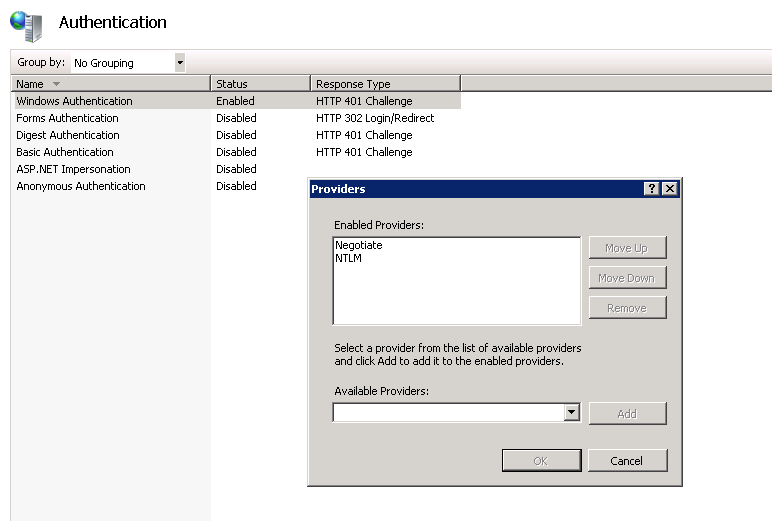 401 - Unauthorized in IE7 only with windows authentication.